on this dreary day, an entrance with rain boots and umbrellas like these would not be too far from reality. I love the orange pillow so much! Now that would be a cheery entry to come home to on a dreary day like today. 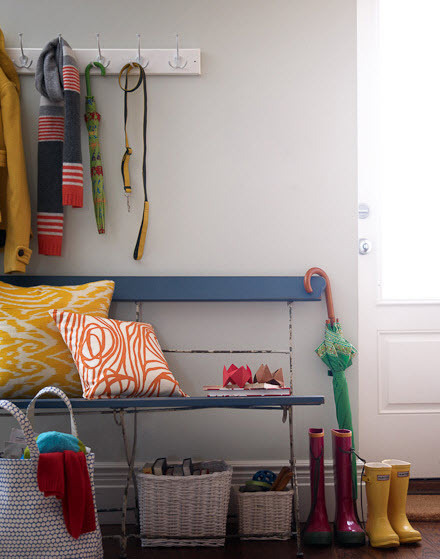 Makes me want to get new pillows for my entryway bench to brighten things up for spring! Love what a difference bright and color items can make to an otherwise pain hallway! very happy! will the sun please come back!! Those cute little hunters are so cheery with the fun pillows. Oh what a way to brighten the day!! Very nice..love pillows. Come and enter my Giveaway (very fashionable) from The French Basketeer! I love the Hable Construction pillow:) so cheerful! Come enter my first give away. My dream home will have a mudroom with spots for wellies and coats! that entry makes me wish my big kids with big shoes were litte again.